There was downtime before the meeting. I asked, “Leafs for real this year?” His response was tentative, but cynical as he was, you could clearly sense the relief he felt for even being able to seriously answer this question. Someone else chimed in, “you’re from Toronto?” My co-worker affirmed this third party’s suspicion, who then nodded his head, saying “only someone from Toronto” and trailing off, unwilling to voice the disappointment he was sure awaited this long-suffering fan. Without a doubt, this conversation has played out all over Ontario this season, as it would be anywhere a notoriously bad team shows signs of life. In fact, it’s a cliché. But it reveals something important about the relationship between fans and the professional sports franchises they support. Fans know, or most do, that their loyalty is somewhat silly, and they give into it with that caveat in mind. Nevertheless, that loyalty is very real and it is based on the existence of a very real tradition that is capable of effecting something at least approaching a secular sacredness. I could go on a cheesy tangent about families gathering around the TV to cheer on their team, or something like that, but I’ll trust that you understand that professional sports help bind people together through ritual (as in they cause us to gather at a given time and place) and common support. Fan tradition is often passed down from generation to generation, and is most often shared by those in a specific geographical region or city. Thus, ones loyalty to a sports team is often given at birth and controlled by circumstances outside of ones control. Maple Leaf fans, after all, did nothing to earn this latest stretch of bad-to-mediocre teams, but they have little choice in what team to follow (jumping ship can only give a paltry relief, for it breaks the assumed code—and sacredness—of loyalty to ones local team). And if such fans are bound to suffer so, does this not earn them some kind of ownership over the team with which they’ve been cursed or blessed? Have Leafs fans not been sticking by a hobbled tradition of Leafs hockey, thus supporting that tradition, or even being that tradition? Does that not earn them some kind of ownership over that tradition? Yet, at the same time—leaving aside for the moment the issue of public subsidies for franchises and the exceptional example of the publicly-owned Green Bay Packers—fans are very clearly not the owners of the professional franchises to which they are so devoted. There are, indeed, actual owners and shareholders of sports franchises, and these are the only people with any actual power over the decisions that are made in regard to those franchises. Still, despite that control, the owners depend on the fans for their livelihood and for fans to support the owners as consumers of their product the fans must feel a devotion to the tradition, which means they must feel some level of ownership over that tradition. As a result, what might be called “ownership dissonance” occurs, with the fans and the owners each claiming an ultimate stake in the team. So in a very real sense, a sports franchise is both a public and a private institution. Those two versions of ownership are at odds with one another, but they exist in a peaceful opposition that is almost mutually beneficial. I say “almost” because this dyadic relationship is more tilted toward one party than it is to the other, as was recently revealed by the controversy over the naming rights of Maple Leaf Gardens and by the recent change of ownership at Maple Leafs Sports and Entertainment. Before we get to that, let us first consider more deeply this notion that fans own a team’s tradition. To do that we must first establish the nature of that tradition. As mentioned above, devotion to a team is often given, as opposed to chosen. Fandom is not always established by ones geography, family history or other pre-existing factors, but fans given to a team by such circumstances form the core of that team’s living fan tradition, and any fan who does choose to be devoted to a team is electing to buy into a kind of informal contract with that team’s existing fan base. That contract stipulates things like: a true fan’s support is not contingent on a team’s success, and a true fan does not split support between teams. A fan’s (informal and non-quantified) share in a team’s tradition is contingent on how well he or she lives up to such loyalty tests. You can be half a Leafs fan, but among true fans, and in your heart, it is known that you will reap but half the satisfaction of the true fan were, say, the Leafs ever to hoist the Cup again (hey, you can dream). But however real such satisfaction might feel, the fans’ ownership over a team’s tradition remains a vague and abstract form of possession. It is not like the collective ownership of a community association, or even like the indirect ownership of a representative government (in which, in theory at least, the voter holds some semblance of decision-making power). No, the fan has no formal power over the franchise’s decision making. Instead, the fan wields power over an accepted and perceived continuity; the fan possesses an informally granted and collectively agreed upon historical pattern of support that continues to the present day. Thus, this current Leafs team is connected to all that have proceeded it, not only through the organization that runs it, but also through an historical pattern of support. As such, the Leafs’ fan base controls little more than the upkeep of their collective support, leaving the privately owned organization in sole governing control over the team on which the fans’ tradition of support depends. At the same time, the ongoing existence of the team is wholly dependent on the ongoing health of the fan-owned tradition. So there appears to be a major disconnect: the fans who are so depended on are not reciprocated with any sway over the team. They are the main investors in the team, but are given no say. Given the public nature of a team’s tradition, you might even argue this setup is akin to taxation without representation, with the taxation being the inevitable money the fans will put down to watch the team. However, that would be to ignore the power of the consumer in a capitalist system. Just as Food Inc. argues that you can vote with your purchasing power to end the factory farming system, a team’s fan base can, theoretically, boycott a team in protest of the organization’s management. While that is unlikely to occur, it does not have to go that far for this principle to come into play. That is, because the fan bases of professional teams are often actively engaged with the team—as is the case with the Leafs—an organization has an implicit incentive to please its fan base, who also happen to be its customers. And because a better team is bound to earn its owners more cash than a bad team, the owners have a built-in incentive to meet the fans’ demand that the team be a winner. Even in Toronto, where the games sellout no matter how bad the product on the ice, there is an undeniable incentive to keep the fans happy by winning (although Toronto fans probably suffer from their own exuberance. Surely the owners in Nashville or Carolina feel more pressure to win because their fan base—or market—is less resilient). However, while the dynamic between fans and owners does reflect the very public dynamic that exists between all producers and consumers in a capitalist society, it also exposes definite restrictions on the public nature of professional sports franchises. Take, for instance, the recent controversy over the naming rights of Maple Leaf Gardens. The Gardens, without a doubt, holds an incredibly special place in the publically-owned tradition of Leafs Nation. Yet, the private entity known as Maple Leafs Sports and Entertainment owns exclusive rights over the use of the publically beloved name of the building, so it has prevented the further use of the name by the building’s current occupiers, Ryerson University and Loblaws. If Mark Norman’s analysis of fans’ reactions on Twitter is any indication, this did not go down very well with the public. But the public, legally, has no say in the matter. The same might be said for the symbol of the Maple Leafs. The Maple Leaf was consciously chosen as the team’s emblem because of its national symbolic resonance, and the name printed on the body of that leaf says clearly that these are the “Toronto Maple Leafs.” It does not say “Maple Leafs Sports and Entertainment’s Maple Leafs.” Yet, there is a smaller symbol printed beside this symbol of great civic and national pride: the trademark. It is telling that it is this smaller, legal symbol that denotes the actual (private) ownership of an otherwise most public of symbols. 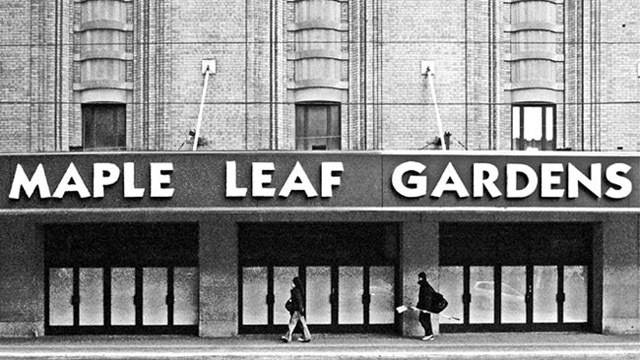 Like the name Maple Leaf Garden’s, the Leafs’ public emblem is the public’s only in the public’s imagination. The question must be asked, though: does the tiny trademark, or the restrictions on the use of a building’s name, really alter the public nature of the larger symbol, or of the historic building itself? Or, do they really inhibit these symbol’s power in the public imagination? No, they don’t, at least not to the extent that the power of the building or the symbol is significantly lessened. That is because the Leafs’ fan tradition is strong enough to withstand these minor perceived slights to their commonly loved symbols. Despite the fact that they do not own the symbol or the building legally, the fans retain a powerful informal ownership over the symbol the building through their ownership of the tradition they represent. Ultimately, that tradition remains as strong as it is because Leafs fans really, really love the game of hockey, and thus will put up with a certain amount of abuse in order to retain the privilege of being able to watch and root for some of the best hockey players on the face of the Earth. But, unfortunately, in the duel-ownership agreement between fans and owners, that devotion to the game is the fans’ greatest weakness and the owner’s greatest advantage. Because Leafs fans are so devout in their following, they must inevitably expose themselves to the shrewd manipulations of the profit-driven ownership. This is especially the case in a place like Toronto, where there is enough money and support laying around for MLSE to price tickets out of the range of a great many devoted fans (I, for sure, cannot afford a ticket), without there being a chance of a non-sellout. With the recent purchase of MLSE by Canada’s two dominant media giants, Rogers and Bell, Leafs fans might expect a similar effect on TV access. As it stands now, TV viewership of NHL games, as with all major North American sports, is already tightly restricted. For instance, if you are like me and do not own a TV, it can be very difficult to watch certain NHL games, even if you subscribe to NHL Center Ice, because cable TV stations own exclusive rights to some games. And last month, the New York Times reported that even non-sports fans who subscribe to cable TV pay good money to support the huge privately held contracts to broadcast sports events. As you have to pay more and more for (legal) access to sports coverage, your sports teams come to feel less and less like yours. Even if you can stream it for free, you are made to feel like you are stealing the opportunity to watch your team. CBC, of course, is the exception to this rule, offering the fan a respite from privately held TV rights. But fans of the Leafs will soon be presented with a trio of enterprises—Bell, Rogers and the NHL—owning sole control of their team and the televised distribution of Leafs’ games (or what the companies call “content”). Of course, the Leafs will remain on TV and fans will retain access to the games. The question is at what price, or how far will the new owners be able to push the fans before they start to see diminishing returns on their product. The exact answer to that question is yet to be known, but we do know two things: it is in the interest of business to push prices as high as the market will bare, and demand for NHL hockey in Ontario is very high. That doesn’t bode well for Leafs fans, whose bargaining power has been reduced to something akin to the dog under the table who would very much like to eat that whole steak, but can only access whatever scraps its owners see fit to toss it. But it will wait for those scraps, and its patient longing for steak opens it up to a form of blackmail. How long will it wait for the meat? What price will it pay? How much will Leafs fans pay for the right to watch their team? The new owners, of course, see no cause for concern. In an awesome example of business communication, Rogers CEO Nadir Mohamed claims that “I think the sports experience for fans is just going to be going through the roof in terms of the experience.” Who knows, maybe the new owners will be kind, or maybe not ripping off the fans will turn out to be a good business move for them. Good stuff Ted, it is a fascinating subject to explore. One really frustrating aspect of the NHL’s business model is that it acts as a cartel that prevents competition. If anyone with the resources to do so could open up a new franchise (or 2-3 for that matter) in the GTA, then this might be a very different story as MLSE would be forced to react much more proactively to fans’ demands.